Today we will be learning how to use Foursquare to replace your guidebook. In a previous post, I showed how to replace a travel guidebook with apps. Today, I will show you how you can replace your guidebook with Foursquare. I am very in love with using Foursquare [Apple iOS | Google Android]for travel planning. The location-based services app tells you which places around you are popular and you can even refine your search to food, sights, nightlife and other details. Besides making travel plans, Foursquare also acts as a map for times when you do not have internet connection for Google Maps. 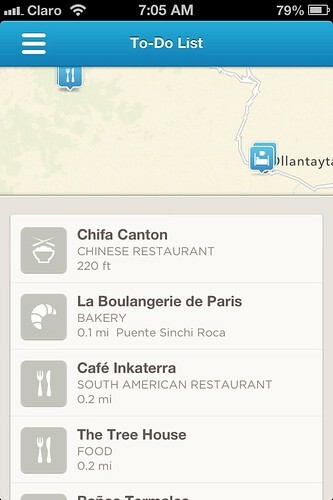 I feel that Foursquare is best for travel planning when you are already in the city that you are visiting. It’s more difficult trying to save a location far away from you. Once you have the app and have signed up for the service, you’re ready to start your planning. For this example, I will use food because that’s the first thing I look for when I’m in a new place. 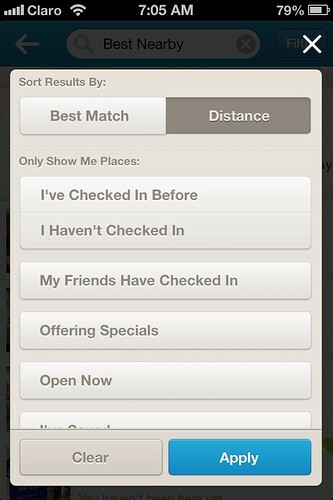 I also switch the results from “Best Match” to “Distance” because I’m too lazy to travel far. You can click each location’s entry to find out more about the place. Sometimes people leave comments or tips and these are useful too. Scroll down the entry to click “Save” to record the place onto your phone. With your saved locations, you are now able to see which sights are nearest to you and plan your route accordingly. Good luck with your weekend trip!